ATTICA, Ohio (May 27, 2016) - For the second time in 2016, Hartford, Ohio’s Dale Blaney earned his place in Arctic Cat All Star Circuit of Champions victory lane at Attica Raceway Park. The six-time and defending series champion had to earn top honors the hard way, charging forward from seventh on the main event line-up, all before making the winning bid during a lap 36 restart. For Blaney, the $5,000 victory equalled 130 with the Arctic Cat All Star Circuit of Champions during his illustrious career, raising the Attica Raceway Park tally to 18 out of the 130. Blaney, a now three-time winner during Arctic Cat All Star competition in 2016, led the last five laps of the 40-lap main event, holding off sixth row starter Byron Reed and former series champion Chad Kemenah. Pole sitter Broc Martin jumped out to an early advantage during the main event, controlling the top spot for the first four circuits around the bottom groove of Attica’s surface. Chad Kemenah, who started fourth on the feature grid, made a bid for the top spot with just five laps recorded and succeeded, driving around the outside of Martin to officially lead lap five of 40. Kemenah, pilot of the Hunter Racing/No. 10H, navigated the very topside of the speedway during his campaign at the front of the field, surviving two cautions and periods of intense traffic during the first 27 circuits. While Kemenah kept control at the front of the field, the action behind him would increase. Positions two and three were juggled frequently over the course of the main event, with eventual winner Dale Blaney, who started on the inside of row four, making his first appearance in a podium position by lap 26, even after making contact with James McFadden while racing for position. The main event’s third caution allowed Blaney to make a move for the runner-up spot, eventually driving around Cap Henry during the lap 33 restart. Meanwhile, Chad Kemenah continued to show the way, separating himself from Blaney even after the restart. Blaney would get the break he needed with just five laps remaining. A fourth and final caution appeared during lap 36, setting up a five lap shootout between the “Low Rider” and Chad Kemenah. Green flag conditions returned with Kemenah on point and Dale Blaney in tow. Blaney followed Kemenah through turns one and turn, setting up a great run down the backstretch, ultimately allowing a slider in turns three and four to seal his winning fate. Byron Reed climbed his way to second from 12th by the final checkers, followed by Chad Kemenah, Cap Henry, and Chris Andrews. The Arctic Cat All Star Circuit of Champions will continue their Memorial Day weekend swing through the “Buckeye State” on Saturday evening, May 28, at the Wayne County Speedway in Orrville, Ohio. Like Attica Raceway Park, it will be the second appearance by the Arctic Cat All Stars in 2016, with local favorite and Wooster native Jac Haudenschild earning the main event win in April. 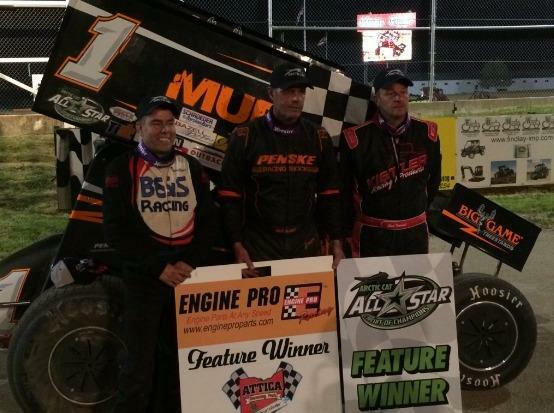 It was Haudenschild’s first ever Arctic Cat All Star win at Wayne County Speedway. Wayne County Speedway will allow pit access beginning at 3:00 pm on Saturday afternoon, May 28. A mandatory drivers meeting will be held at 5:30, followed by warm-ups at 6. Racing action is set to hit the speedway at 7. If needed, a rain date of Sunday, May 29, will be utilized. For more information, please visit Wayne County Speedway live on the Web at www.waynecountyspeedway.com.